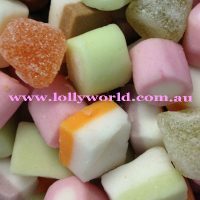 Dolly Mix is a British confectionery by Kingsway, and another one of my top 10 lollies. Originally by Barratts and consisting of a variety of cute little pastel coloured fondant shapes, they are like little cubes and cylinders. The mixture consists of small soft sweets and sugar-coated jellies like Jelly Tots.